My wife and I had put off too long a trip to Antarctica and finally took that long awaited itinerary. I wish we had done so earlier!! The entire experience (with one small exception) went off without a hitch and, as usual, we enjoyed the family-like Azamara experience. This being our 10th Azamara cruise we had a pretty good idea of what to expect, though The Pursuit is a recent addition to the Quest and Journey. The layouts are identical so it was just like returning home. A number of the crew were familiar transfers from the other ships so it really did feel like family. 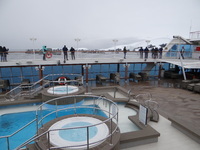 The ship was renovated before being put into Azamara service with the new Deck 5 layout sans Casino. Honestly, on this size ship, the casino was little more than a nice diversion and the extra space in the newly converted "Den" was put to good use. Though we had a 7 day stretch where we were limited to staying on the ship, it seemed to pass quickly with the interesting "cruise by" itinerary of the Alaskan peninsula. Passing a number of HUGE icebergs was also a favorite of all onboard. Best of all, we were lucky to have pretty calm seas passing through the Drake Passage twice and the horror stories some people told us about never came to pass. Entertainment was varied, though by necessity it is limited to guest entertainers and a small ensemble of singers and band. Still, they were excellent, professional, and interactive. The stops were all interesting and fun, and the AZAMAZING EVENING in Montevideo was a presentation of the Urguayan Carnivale and was one of the top two AZAMAZING EVENINGS we have experienced! 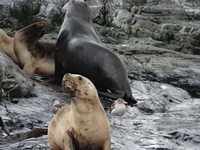 Wildlife during a cruise of the Beagle Channel. 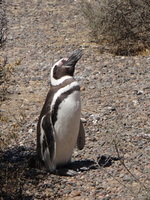 Magellenic penguin at Puerto Madryn. My wife and I had put off too long a trip to Antarctica and finally took that long awaited itinerary. I wish we had done so earlier!! The entire experience (with one small exception) went off without a hitch and, as usual, we enjoyed the family-like Azamara experience. This being our 10th Azamara cruise we had a pretty good idea of what to expect, though The Pursuit is a recent addition to the Quest and Journey. The layouts are identical so it was just like returning home. A number of the crew were familiar transfers from the other ships so it really did feel like family. The ship was renovated before being put into Azamara service with the new Deck 5 layout sans Casino. Honestly, on this size ship, the casino was little more than a nice diversion and the extra space in the newly converted "Den" was put to good use. Though we had a 7 day stretch where we were limited to staying on the ship, it seemed to pass quickly with the interesting "cruise by" itinerary of the Alaskan peninsula. Passing a number of HUGE icebergs was also a favorite of all onboard. Best of all, we were lucky to have pretty calm seas passing through the Drake Passage twice and the horror stories some people told us about never came to pass. Entertainment was varied, though by necessity it is limited to guest entertainers and a small ensemble of singers and band. Still, they were excellent, professional, and interactive. The stops were all interesting and fun, and the AZAMAZING EVENING in Montevideo was a presentation of the Urguayan Carnivale and was one of the top two AZAMAZING EVENINGS we have experienced! As expected and roomy enough for my wife and myself. We enjoyed several room service breakfasts on our balcony which was fun in the cold as we passed snow capped mountains and ice bergs. Loved the artistic vibe and intensity of the locals! 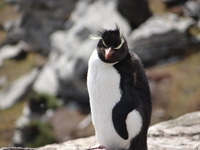 A long bumpy ride in and out was worth getting up close to the Rockhopper colony that was fascinating. These little dudes are entertaining and cute! Three hour tour (not like Gilligan's Island!) that took us to several islands in the channel and past numerous wildlife.